ISO certification ensures globally accepted methodology. 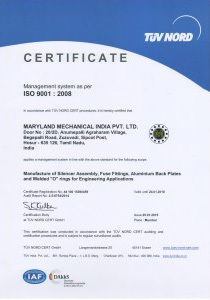 Stevensville, Md., April 30, 2015 — Michigan Manufacturing International (MMI) is pleased to announce that its manufacturing facility in Hosur, India was recently awarded ISO 9001:2008 certification. This certification means that the manufacturing process at Maryland Mechanical India Pvt Ltd meets a globally accepted methodology. The ISO certification by Tuv Nord means that the manufacturing process followed by MMI can be demonstrated through verifiable records. This level of quality assurance signifies that parts are made to the required specifications by adhering to the approved process, providing peace of mind to customers. MMI photoFounded in 1991, Michigan Manufacturing International (MMI) specializes in supplying manufactured to print assemblies and components to original equipment manufacturers (OEM). Products include assemblies, castings, stampings, machined parts, gears, bearings and more. Services include product engineering, manufacturing, inventory management and stocking programs — all designed to streamline client operations and increase profitability. MMI designs the most effective, highest quality solutions from anywhere in the world.